No one wants America’s nuclear waste in their backyard. Neither the people who’ve lived adjacent to nuclear power plants for decades, nor the citizens of the communities being considered as dumping grounds. Even as debate rages over the issues related to the decommissioning of San Onofre Nuclear Generating Station (SONGS) in Southern California, the "painstaking process" of shutting down San Luis Obispo's Diablo Canyon plant invites attention. Meanwhile, protests erupted last week in response to a plan to store spent fuel from U.S. commercial reactors in New Mexico. Holtec International – the company whose storage canisters have sparked concerns about safety at SONGS – has proposed to construct a below-ground space in New Mexico with the potential to "temporarily" house about 100,000 metric tons of waste. According to a story by ABC news, while some residents support the plan, describing it as an economic boost, significant opposition to it comes from several members of New Mexico’s congressional delegation, as well as the area’s ranchers and dairy farmers. Native American citizens have also spoken out against it, USA Today’s Carlsbad Argus reports, quoting Leona Morgan, co-coordinator of the Albuquerque-based Nuclear Issues Study Group and a Diné activist, calling the project an example of “nuclear colonialism,” forcing low-income and minority-majority regions to unfairly bear the risk of storing nuclear waste. The U.S. Governmental Accountability Office (GAO) notes that the United States has over 90,000 metric tons of nuclear waste that requires disposal. As no site for permanent storage currently exists – despite decades of discussion – most of this waste remains stored in the 80 sites where it was produced. This means 35 of America's 50 states serve as interim homes to material that can pose a serious risk to humans, animals and the environment. (Comedian-slash-investigative-journalist John Oliver did a segment on the problem, prompting a critical response from Forbes' energy writer James Conca.) The GAO further identifies the biggest obstacle to a finding a permanant storge solution as social and political opposition. "This is the key obstacle—not technical issues—to selecting and building a facility," reads the GAO website, noting, "Important tools for overcoming this debate include transparency, economic incentives and education." Other identified hindrances to moving nuclear waste away from its origins include a lack of funding leadership, organizational capacity and legislative authorization. And it's not like you can just chuck the canisters in the back of a pickup and drive them away from the heavily populated, fault-laden areas where they're currently stored. 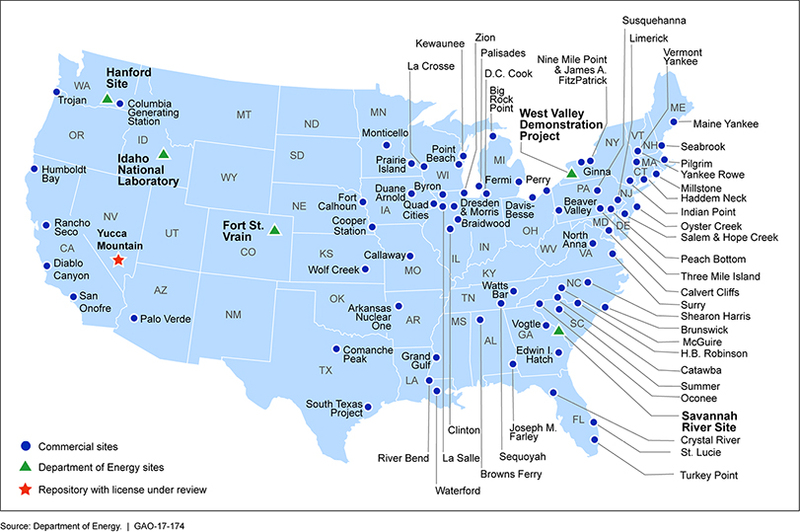 Transporting radioactive waste to interim storage sites is – again according to the GAO – "no less complex than shipping to a disposal facility and could result in shipping the waste twice – first to the interim storage facility and then to the permanent facility. In both interim storage and permanent disposal scenarios, the shipping campaign is likely to take decades, which could result in overlap of operations." In summary, while everyone acknowledges the current habit of storing nuclear waste in places not designed to do so is a problem, the fact is without community consensus, political leadership, federal funding and a slew of experts working to solve the transportation problem, a solution doesn't exist. So what can a concerned citizen do? Contact your Congressional representatives and urge them to take action to secure a location for a geologic repository deep underground. Ask for legislation that not only authorizes new contracts for interim consolidated storage facilities, but also requires a final resting place to be sited and a mandatory timeline for solid waste transport and permanent storage. Ask them to convene a panel of experts on nuclear waste hazards, transport and storage should be utilized to address the issue. Southern California residents can join Surfrider in telling Congress to get waste off the beach at San Onofre now! Update: What's Happening With San Onofre Nuclear Waste?